A Twitch streamer who has Tourette Syndrome has been experiencing a sharp increase in Twitch followers and viewers after some of her clips went viral. Anita’s clip below (via Dexerto) is one example of a clip gone viral from one of her “Just Chatting” streams where she interacted with viewers. She talked about what types of games she plays on her channel, titles that include The Forest, Overwatch, and Bioshock, and the clip has been watched over 1 million times since it was created. Sweet_Anita only has 10 videos saved on her channel, but you can see a steady increase in their views from the time the first few were posted to the more recent ones in October. Starting within the thousands of views, her videos soon crossed over into the tens of thousands with one video amassing more than 44,000 views. Her clips show a much larger increase in views with those from the past 7 days consistently hitting marks in the tens of thousands, one even breaking the 100,000 views mark. 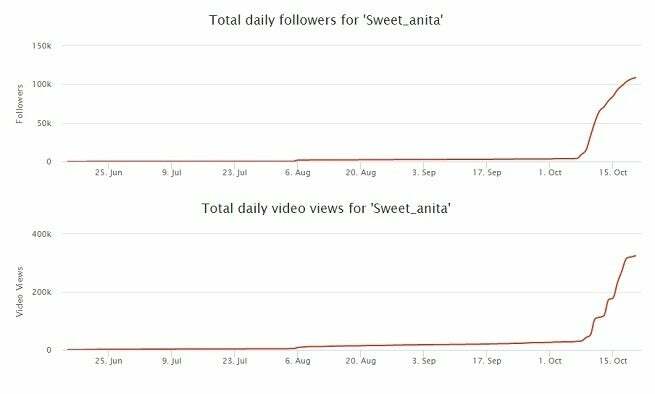 Social media-tracking site Social Blade has stats for Sweet_Anita’s Twitch channel that make her quick amassing of followers much more evident with her numbers only increasing since the start of the month. The most dramatic increase in followers was seen on October 20th when her channel attracted 18,481 followers, the day before bringing in 18,340 in just one day. Graphs for her daily followers and video views throughout the past few months show a similar increase with the streamer’s channel growing in both metrics around October 7th when her videos and clips first started going viral. Sweet-Anita’s Twitch channel can be viewed here with a timer found in her “About Me” section to show when she’ll be live once again.